Maine has eight species of these reptiles, living mostly in wetlands, with some using vernal pools for the rearing of young. “Vernal” means springtime, and these pools are small pools of water that begin to form in the fall, but really only appear as pools in spring. Then they slowly dry up throughout the summer. So, that is how these springtime pools get their name - vernal pools. The eight kinds of turtles found in Maine are: spotted, snapping, box, wood, musk, Blandings, and two kinds of painted turtle. Turtles have been around since the dinosaurs. Their hard shells have protected them from predators and the environment. But today, most species are in serious decline. Their habitat is being lost through development (and filling in of wetlands). Also, the turtles’ strategy of pulling into their shells to avoid danger is no longer effective - because the greatest predator danger they face is traffic. And a shell is no match for a car! Some places, like York County, Maine, have begun posting turtle crossing signs on the roadside - to remind drivers to watch out, and avoid hitting turtles as they cross the road. If you want to help a turtle cross a road, you can pick it up and carry it to the side to which it was already heading. 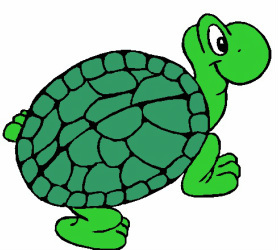 But make sure the turtle is not a snapper - they’re called snappers for a reason! If you find a snapper in the road, just walking slowly behind it will encourage the turtle to move along. But always be careful when in a roadway. Turtles can live a very long time - the Blandings turtle in Maine can live to be 75 and snapping turtles live an average of 35 - 40 years! So, they do not make good house pets, but are best left in the wild. To enjoy turtles in the wild means we have to conserve their habitat and watch out for turtle crossings on roadways. The most common turtle to see in central Maine is the painted turtle, and they can usually be seen sunning themselves on logs, either in rivers or lakes. Snapping turtles are quite common, too, but usually only their snouts stick out of the water. Turtles are reptiles and that means they are cold-blooded. So, when the winter months come they bury themselves in the mud to await the spring thaw. Turtles lay eggs in a nest, and then leave the young on their own.